Just a girl with a hammer: Officially ready for rain, damn it. Guys, I'm so sick of watering the garden. I'm sick of sunshine and warm weather and the hard rocky soil that prevents me from putting my new grasses in the ground. OH I KNOW. I know. I should shut up. I need the gutters to tip toward the right side of the house, to the downspout that leads to the buried PVC pipe that carries the water to the rain garden. 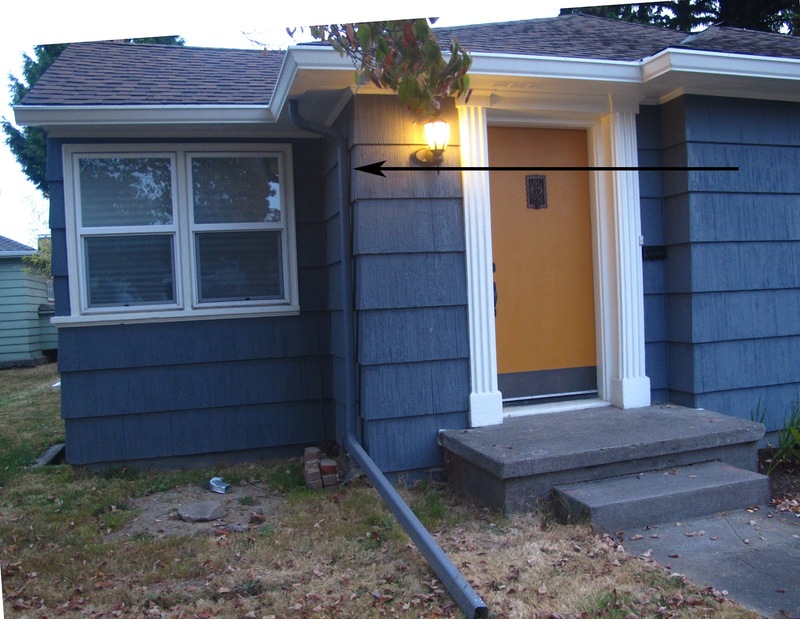 So these guys came out, removed the gutters, cut them down, then repositioned them so they tip to the right. They also removed the downspout there, so we need to do some touch-up painting. They left the gutters a grimy mess but otherwise everything looks fine. Now I just need some rain to make sure they work properly. I spent the weekend ignoring the sunshine and making a freezer full of empanadas and contemplating sewing projects. I am ready for cool weather. I'm ready for long sleeves and homemade pasta and movies and pining for spring. Let's do this. I've naturalized! I miss the rain. Stupid, I know. I'm so ready for the rain too...I'm tired of it being hot and sunny...it's just so monotonous after a while. If I liked the sun, I'd have moved to Phoenix! Did it work? I've been thinking about getting out the soaker hoses. I just don't want to have to drag the hose to that part of the yard yet. Amazingly, yes! It wasn't as easy as planting after a few days of nice, soft rain...but it was workable. I just poured out the water, let it soak in for a few hours, then repeated 2 more times that day, then let it sit overnight...on Sunday morning, I was in business. Granted...this area did get some water this summer, so it wasn't pure cement...pretty close, though. The trick is to cover the area with mulch (which mine was) or something else to keep the water in place and slow it down...otherwise, it just runs off the soil. Awfully dry here as well, though it is much cooler. I know we really shouldn't complain here, when your part of the country got it so much worse. It's just so weird to have it get dark while it's still so warm out! I'm clearly the only holdout that loves this weather. If it does have to rain, I think it should be "Camelot"-style, you know, only after sunset (and by 8 the morning fog has disappeared, la la la.) Don't worry, you'll get lots of time to enjoy your new gutter perspective too soon for me! I would totally be okay with rain from midnight to 6am and then sunshine for the rest of the day. Can we order that up? What did you feed your Castor Bean...small rodents? It has to be the most gorgeous evil plant on the planet. It got watered every day and I did give it some fish emulsion toward the end. Isn't it crazy? I bought it at the Rare Plant Research sale--I'm guessing that has more to do with it than my care. I'm going to be so sad when I can't replicate this next year. Okay my new favorite quote for the week "If I liked the sun, I'd have moved to Phoenix! "...OMG, so Portland! And I really like your "just do it" solution to planting. I just saw, catching up, your rain garden posts. I love rain gardens. I've put in a rain garden/swale to handle to handle the rain that runs off the street into my yard (which is the low point for several houses width.) I'm on my second excavation, because it silts up with winter road sand. That would not be so bad, but it grows weeds like green bay trees. Did you use landscape fabric or something to control weeds? I never use landscape fabric. It doesn't block weeds, it never stays in place, and it stops you from moving plants, feeding the soil, etc. I hand weed and I applied three inches of mulch. I reapply mulch (fine dark fir or hemlock) every year, which seems to keep everything manageable.